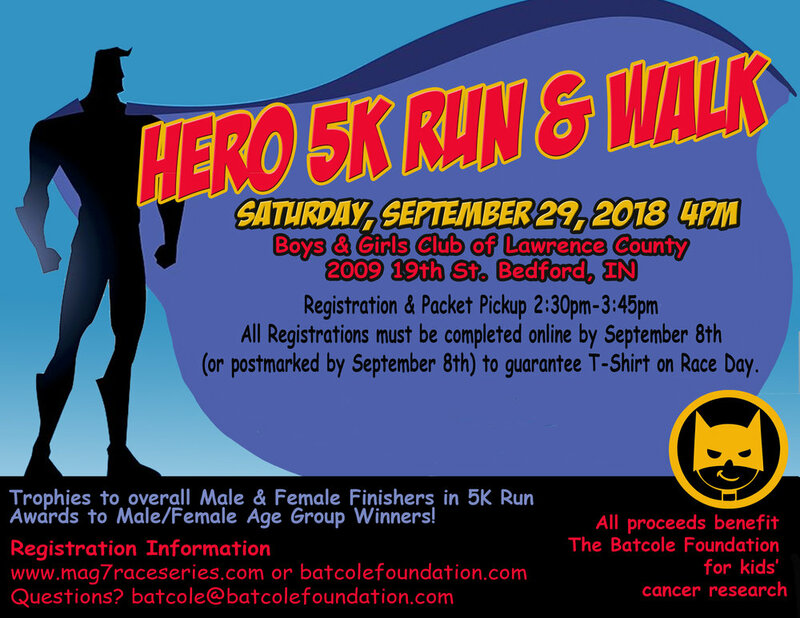 Save the date for the 2019 Batcole Hero 5K Run & Walk! Make plans to join us! The Salt Creek Brewery has again chosen the Batcole Foundation as its chosen charity! Registration and check-in on Saturday, October 27th from 3 to 3:45 p.m. ATTENTION Mag 7 Series competitors: Only the 5k run and 5k walk will count for series points. No series points are available for the 10k. 10k option: For the past 4 years, we’ve heard participants say how much better the course would be if we ran it in the opposite direction (less hills? do you really think so?). This is your chance. 10k participants will literally run the course backwards and forwards… tell us at the end which direction you liked better! LIVE MUSIC! If you want to hang out at the Brewery, we will be having entertainment before, during, and after the race! Bands will be announced at a later date! If you have any questions, please contact Heather Bagshaw at hkhoosier@hotmail.com. Are are ready for the Batcole Hotwheels? We are super excited! New this year will be rides in a street legal Nascar (age dependent), along with the favorite Hot Wheel Box for pictures and of course, the races! Food, fun and something for everyone! Hope to see you there! Friday, September 14th at Johnny Junxions!! This is a day of caring on Cole's birthday! We want everyone to take time out of their day to bless someone else- take a treat to a shut-in or neighbor, take some toys to the hospital, pay the adoption fee for a shelter animal-- be like Cole! We are also accepting gift cards for our caring program to assist families impacted by pediatric cancer, and we will be accepting gift card donations for food and gas (BP, Shell, Kroger, Marsh, McDonald's Subway, Blaze Pizza, Qdobo, Visa gift cards, etc)! 3rd Annual Batcole Hot Wheels Nationals! Make plans to join us for the 3rd annual Batcole Hot Wheels Nationals at Johnny Junxions! How well do you know your Vette? Join us at Marian University for a Corvette Car Show on Saturday, April 22, 2017! Registration is from 7:30-8:30 am, Dash Plaques and Trophies will be awarded at Noon! $25.00 entry donation, and pre-entries can be mailed to: "Know Your Vette", 600 San Ricardo Ct., Greenwood, IN 46142. For any questions, please contact Jeff at 317-446-5087 or email us here at batcole@batcolefoundation.com !! Hope to see you there! Salt Creek Brewery has chosen the Batcole Foundation as the recipient of this year's sponsorship! Hope to see you at the event! Check-in and Walk-Up Registration from 3 to 3:45 p.m.
5K Run/Walk starts at 4 p.m.
Childcare is not provided for the 5K, please make arrangements for your kids (they can be on the 5K course (strollers, etc) provided they're supervised! Event Schedule (Subject to change)! The following event starts at 4PM! Hot Wheels Photo Booth-turn your car into a real life Hot Wheel! Photographer on-site for pictures! The following events start at 6PM! Hot Wheels Races- Purchase Hot Wheels cars and register for races on-site at event! Lemonade Stand- sponsored by Cole's friends! Batcole Gear-new this year, Batcole Hotwheel National shirts! Proceeds benefit the Batcole Foundation for kids' cancer research! Super Hero Mini Sessions- Benefiting the BatCole Foundation. 50% goes straight to the BatCole Foundation! *Option to purcase additional images or prints.